After this time away, I’m very happy to be returning with a post that is very special to me ! 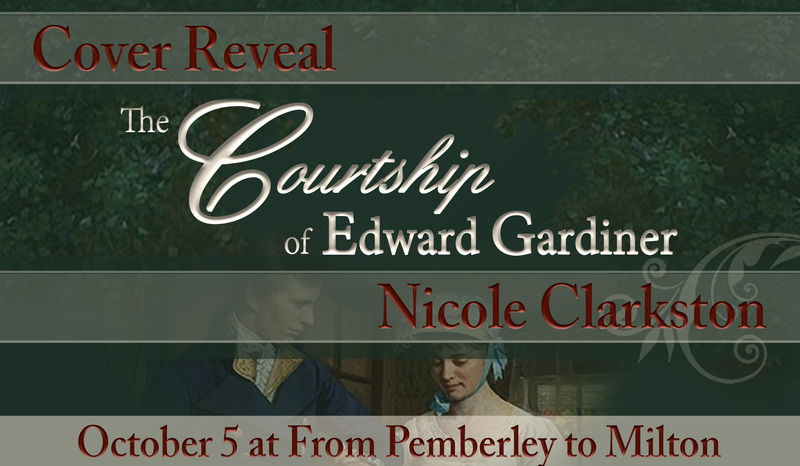 I’m incredibly honored to be the one doing the cover reveal to Nicole Clarkston’s new Pride and Prejudice novel: The Courtship of Edward Gardiner. 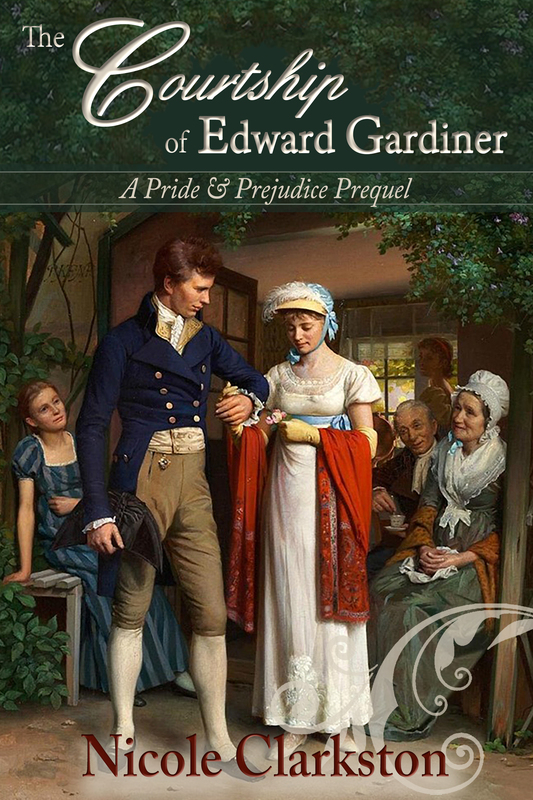 This is a sweet prequel of Pride & Prejudice taking Mr. and Mrs. Gardiner as main characters and will be released on October 21st. The book is already available for pre-order, so if you are curious about it, you can check it here. What did you think? Did you find this appealing? Curious to know where Edward Gardiner meets Madeline Fairbanks? I’ve mentioned I’m honored to be doing the cover reveal and that is partly because Nicole Clarkston’s writing is exquisite, and partly because of the cover itself, or better yet, the cover creator. This cover was created by Janet Taylor from JTOriginals, and I’m sure that many of you already noticed I’m a huge fan of her work!! It all started when Janet’s close friend Jan Hahn suggested she drew a picture for the cover of one of her books, the soon-to be released, The Journey. Janet Taylor accepted the challenge and even if the cover ended up not being used for that book it was the beginning of many more drawings, the Jane Austen calendar, and merchandise featuring her drawings. Janet started searching the internet for pictures and/or paintings that might work for this book, she sent several of them to Nicole Clarkston and she chose this one almost immediately. This beautiful painting was Janet’s pick from the beginning because it fit perfectly to the story (she always wants covers to give hints to what is inside, everything on them needs to play a part in the story or depict something in the story, even the back cover) so she was very happy this was Nicole Clarkston’s pick as well. The editing of the image began and the result is a little different from the ones Janet did in the past, but beautiful as always, don’t you think? The painting on the front cover is titled, ‘The Newly Engaged Couple’, 1881, by Carl Thomsen of Denmark and I think it perfectly fits the story! What do you think of it? As I said, Janet Taylor really loves to pay attention to the details of her covers and that also includes the back cover, so we would like to show you the entire book cover! What do you think of it? Isn’t it incredibly tasteful? 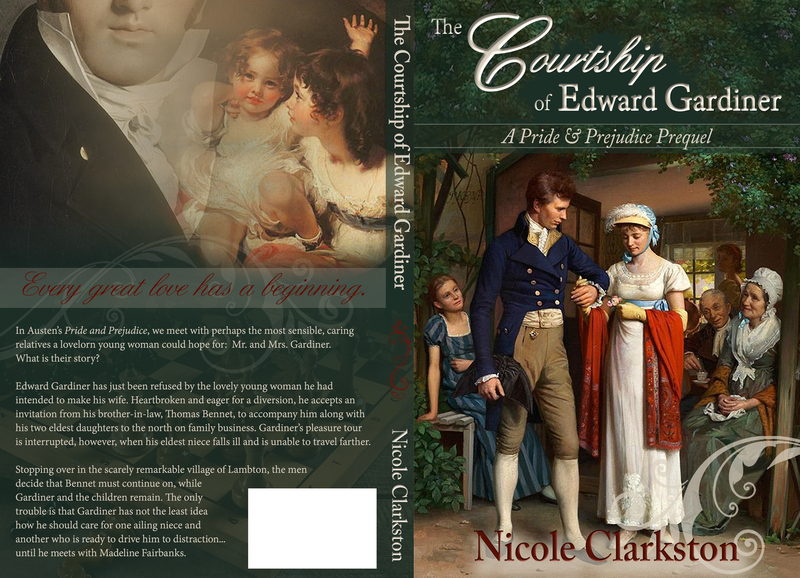 Nicole Clarkston would like to offer 2 copies of The Courtship of Edward Gardiner to our readers. The giveaway is international for ebook copies and is open until the 15th of October. All you have to do is comment this post and share with us your thoughts and encouragement to Nicole’s new release. OH, but this is LOVELY!!! Congrats, Nicole and thank you for posting. Gorgeous. Love the fonts, and the painting. It’s a gorgeous cover, ladies! I can’t wait to read this book! I believe that this will be a fun read. Especially whatever antics that Elizabeth gets up to, because you know that she will be keeping everyone on their toes. Can’t wait to see the interactions of the younger versions of ODC. Yes, that’s a good way to look at it! Wow, that cover is gorgeous! The book sounds fantastic, too. Thanks for the giveaway! Rita,whst an honour to have been chosen to reveal the cover of Nicole’s latest P&P book!! I think it’s absolutely beautiful and so becoming the characters of Madeline and Edward! The genial Edward,standing tall,so evidently proud to have Madeline by his side,while she looks demurely to the ground,a little bashful, knowing that she is the centre of his attention and indeed,his world!! Not forgetting the back,with,I’m guessing the adorable rosy cheeked Georgiana and Lizzy!! And is that the presence of the young Master Darcy I see near them? We’ll done Janet! I think in this case,you can judge a book by its cover!!! Best of luck with the book,Nicole! Mary, as always, thank you for your kind comments! Didn’t Janet do a gorgeous job? She put together something that so perfectly captures the story! Such a sweet couple deserves a face, and she gave it to us! Thank you Rita for hosting the reveal. Good luck to everyone in the giveaway! My, thank you, Rita. When you asked me to tell you how I started doing covers and where I found the painting on the front, I never imagined you would be ‘featuring’ me quite so much. I’m honored and humbled by your kind words. This prequel is such a lovely story that I had to make a cover that would do it justice. When you read the story, you will see how perfect this painting fits. It was amazing. Then Nicole cleverly adapted a few minor touches in her story to make it fit even more. I can’t wait for all of you to get to read her book. If you don’t already love Edward and Madeline Gardiner, you will. I can believe it happened just as she wrote it! As for the back, Mary, you are right on! For me, one of the special things about the back is the tag line. Of course, it is about the Gardiner’s but its placement fits ODC. When I was trying to decide where everything should go, I noticed the tag line and knew it had to be there, giving it a dual purpose! Thanks to all of you for your wonderful comments on this cover. It was such a pleasure making it and working with Nicole again. She’s a jewel. gorgeous cover….I had commented on another blog that the Gardners were favorites and I could imagine their story being a great romantic read…thanks for the opportunity to read their story! Love the blurb! The front and back cover is beautiful! Heard so many great things about this novel already and I can’t wait to read it! A perfect cover (front and back) for a perfect couple! Congratulations on the cover reveal Rita and on the book, Nicole! I reading some wonderful ARC reviews already so can’t wait to read it! Thank you for your generosity too! Vesper- It is the young man we are *just* beginning to see. I love Janet’s symbolism! I adore the front and back covers. I am eagerly anticipating the release of this book. Beautiful cover! How wonderful to see a story dedicated to the Gardiners! Congrats, Nicole! Oh yes, this story has me eager. I love when minor characters get their story told and I recently enjoyed Nicole’s writing in Northern Rain. Speaking of Northern Rain, the cover grabbed me and I recognized Janet’s signature art of course. And this cover is so gentle and sweet that I want to see it in my eye as the story unfolds. Congrats to both Nicole and Janet for the story and cover. Thank you, Sophia! Janet showed me this painting just before the final few chapters were finished, and it gave the characters new life in my mind, too. What an interesting sounding story and cover! Congrats and best wishes! What a great idea for a story. I’ve never read one like this before so I will be sure to check it out. The cover art is absolutely beautiful. Janet never fails to amaze me with her art work, and this cover is another example of her dedication to making the front and back of the book beautifully reflect the story. When I introduced Janet to the JAFF world, I had no idea the name she would make for herself with readers and writers. I’m proud of her success. It couldn’t happen to a more deserving, talented person. And Nicole, your story sounds lovely. Can’t wait to read it. Isn’t it funny the ripple effects we can have? Thank you for throwing her into the mix, Jan! I’ve always adored this painting and I love what Janet’s done to enhance it for this cover. I’m not surprised it’s a wonderful cover: Janet Taylor also created the beautiful original front and back artwork on my first novel, Alias Thomas Bennet. She used lead pencil crayons with her own photos as a basis for the drawing. I still remember how overwhelmed with excitement I was when I saw how she’d taken an offhand suggestion of mine that I thought might be added in the corner and made it the centrepiece of the front cover! She included details like a rope to protect wee Jane from falling into the water while she held onto her father’s fingers. Her input also made for a catchy blurb when my attempt was on the boring side. I know Nicole adores her as much as I do. Obrigada for hosting this reveal, Rita! Best wishes on the new novel, Nicole, and kudos for featuring a minor character! Thank you, Suzan! I was ogling your new release too, I’ll be snatching that one up! Oh myyy, that is just gorgeous!!! Janet and Nicole,you should be very proud of it. Sometimes I feel that the back covers of booksare somewhat neglected but not this one. Like you, Rita, I’ve been absent for a lot of the summer due to “stuff and things” going on in my life, but just had to pop in to comment when I saw the link on FB. There was a post on FB once asking which Austen couple folk would like to be adopted by goven the chance. The Gardiners were the most popular by far, though I had to give an honourable mention to Admiral and Mrs. Croft as well. This one is definitely going on the Wish List. Looking forward to seeing how all of the various characters are woven into the story. What Janet did with the back cover is so perfectly fitting, because in this case, it’s the back story that really drives the front. We all know what happens fourteen years later, so while the Gardiners take center stage here, we-who-know-the-future can enjoy what is developing in the background. I have loved all your other books, I just know I will enjoy this one also. Thank you, Nicole! A very high compliment, I do not take it lightly. An absolutely gorgeous cover! I’ve been reading reviews of this on GoodReads and I can’t wait to read it. They’re a couple I always liked in P&P. The relationship between them both always struck me as very loving without being showy. Good luck with it Nicole. My, this was a post just filled with good news. I’m certainly looking forward to the new book. The picture is beautiful and the book sounds fun! I read this and posted a review – loved it. What an exciting idea! I’ve read your other P&P books and loved them. That’s the first one devoted to my second favorite couple (apart from D&E). Looking forward to an opportunity to read it. I loved ‘Rumours & Recklessness’, and this one sounds excellent too. Beautiful cover.